Sometimes you just have to slow down and take care of those little things in life…the stuff that’s not hard to do, but you just have to take the 30 seconds to Google the answer, and make it happen. For me, that was finally figuring out how to make my Mac show the extensions in my file names. Sure my desktop looks cleaner without them, but it does get confusing when I start having different versions of the same file in different formats. 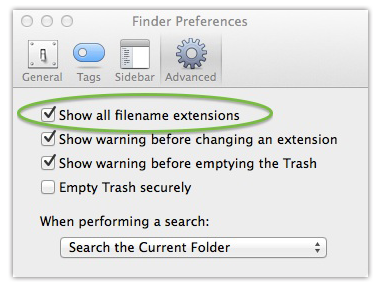 Turns out all you have to do is go to Finder > Preferences > Advanced > Show all filename extensions. Presto-change-o! Never confuse your file types again! Here’s the official documentation on the feature. Why might you care for this feature? In my case, I had built a presentation in Keynote, then made a screen recording of myself giving the presentation. For orderliness, I wanted the video file (.mp4) and the presentation (.key) to have the same file name. It got way too confusing without the extensions showing, and having to open the get info menu every time felt like a descent into first-world-problems madness. Should I be concerned that my sanity in fact hinges on the status of a trivial checkbox? Nah..that’s totally normal. Posted by Queenie Chow at 7:00am May 29, 2014 Posted in Tech Tips. Bookmark the permalink.